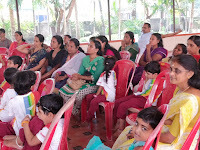 Sishuvihar children in Amrita Vidyalayam with their escot teachers. For the firs time both LKG and UKG tots participated in an Inter school Art competition.at the end of which each received a memento and a balloon, the most precious gifts. The heavenly smile in their faces!! Children are like precious gems. Children are adorable. They are like divine gifts that parents get from the almighty. Their eyes are full of innocence. They smile when they receive love and admiration, they cry when it is their first day at school away from their parents, they giggle when they mingle with their buddies, and they signify nothing but the pure and faithful love. They truly symbolizes god. 14th November is celebrated as children's day in all over India. Childhood memories are sweetest of all. They can be savored for a lifetime. 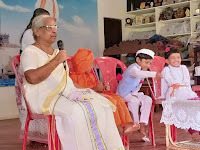 Children's day celebration is fun for the little ones but it is important for the parents too. Every parent must understand the importance of the children's day. Parents should be well aware about the little desires of their angels. 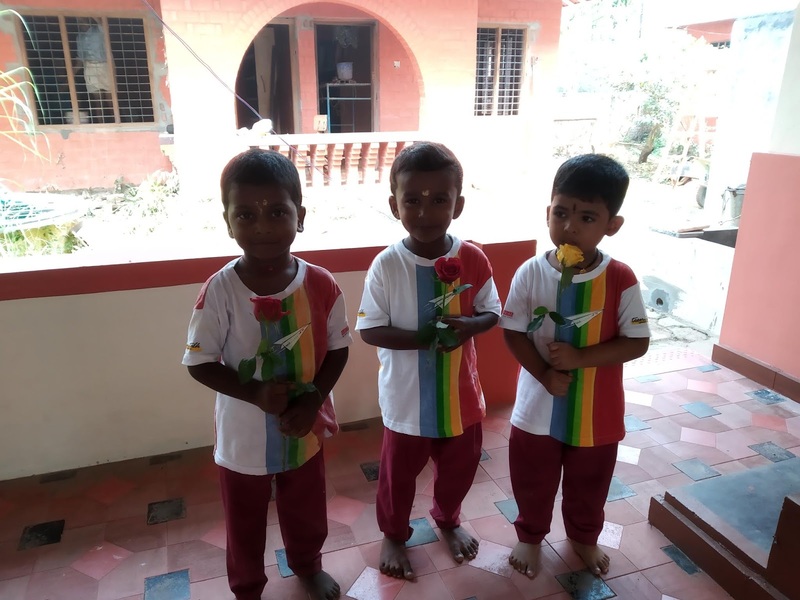 The tiny tots of LKG and UKG of Sandeepani Sishuvihar put up a short programme with the help of their teachers on 14th November which is their 'Sisudinam'. 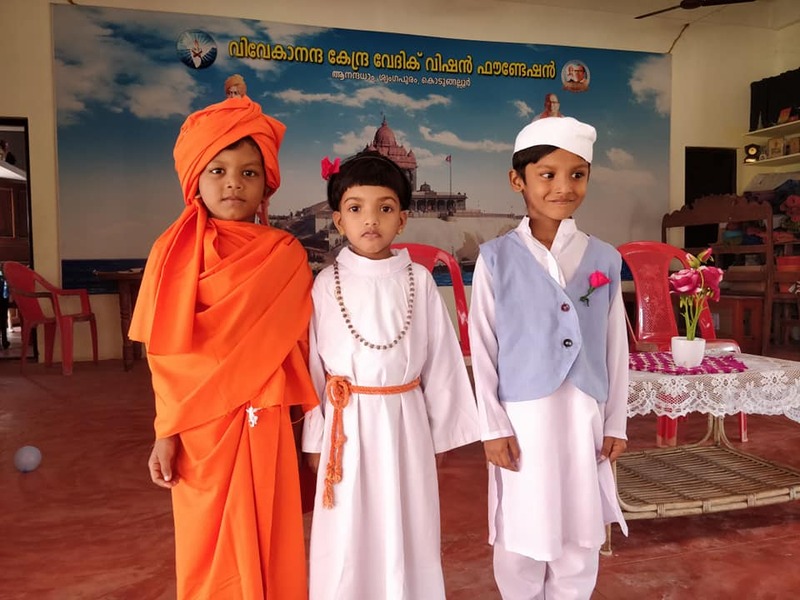 It began with an opening prayer, lighting of the lamp by three 'Sishu' Guests Master Arav, dressed as Chacha Nehru , Master Agneya dressed as Swami Vivekananda, Kumari Anagha as Sister Nivedita. They were welcomed to the dias by offering a colourful rose flower to each by the LKG tots.Sri Sudhakarji and Mananeeya Didi too sat with them to encourage them and give their blessings. 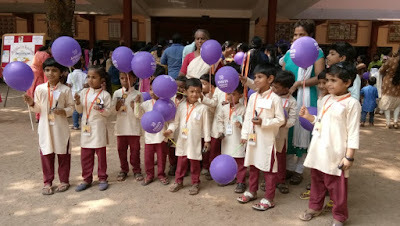 Each of the tiny tots presented either a song, rhyme or story. The tailoring students and teachers, the yogavarga members and inmates of Anandadham were all present to watch them perform!